Designer Nora Bellows' beautiful and artful Noni bag and flower designs have earned her international acclaim. 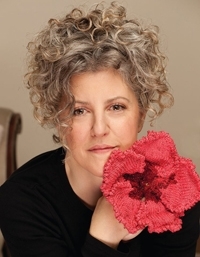 Now, in her first book, Nora shares 40 of her exceptional knitted and felted flowers, along with six bag, garment, and home projects perfect for floral embellishments. Inspired by nature, Nora's handmade creations capture the essence of each flower and bloom. Featuring gorgeous full-color photography and clear instruction, this visually stunning volume will be irresistible to knitters everywhere. A former academic with an MFA in creative writing and PhD in English Literature, Nora began creating one-of-a-kind felted bags and felted flowers under the brand Noni in 2001. She began publishing her pattern line a few years later. Noni patterns are available in over 600 yarn stores domestically and internationally, and have been translated into German, Danish, and Swedish. Her work has appeared in Interweave Felt, Knitting Today, Vogue Knitting, and Simply Knitting. She teaches workshops across the country.